Dermalstyle® – The Gentle Secret of Eternal Youth…..
Dermal augmentation with hyaluronic acid – as it contained in Dermalstyle® – has become one of the most popular aesthetic procedures available to everyone who desires non-surgical facial rejuvenation. One of the principal characteristics of hyaluronic acid is its ability to retain water which significantly contributes to the skin maintaining a youthful appearance. But like many other essential factors, the level of hyaluronic acid in the body decreases with each passing year. The effects of aging, pollution, stress, fatigue and toxins leave their marks and the skin loses its suppleness and elasticity. As our skin ages, hyaluronic acid, collagen and elastin are gradually lost from the dermis. Over time, these factors contribute to the development of lines and wrinkles in the face. A specific wrinkle treatment with Dermalstyle® provides for an immediately visible, naturally appearing and long-lasting skin rejuvenation for women and men. Preserve your natural radiation with Dermalstyle®! Dermalstyle® Light contains the highest concentration of non-animal sourced and non-crosslinked hyaluronic acid currently available. The composition of DermalStyle® Light is hyaluronic acid 18mg/ml and 20 mg/ml glycerol. 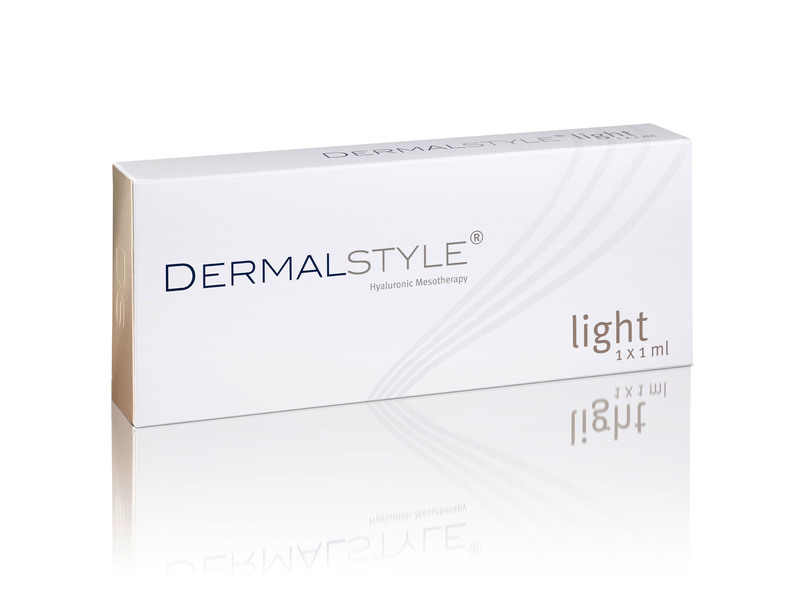 Dermalstyle® Light is a viscoelastic solution to compensate the loss of hyaluronic acid due the ageing. It is especially designed for injection into the super cial dermal tissue, to improve tone and elasticity of the skin and/or to act as filler for small lines such as crow’s feet, smile lines or smoke lines surrounding the mouth. 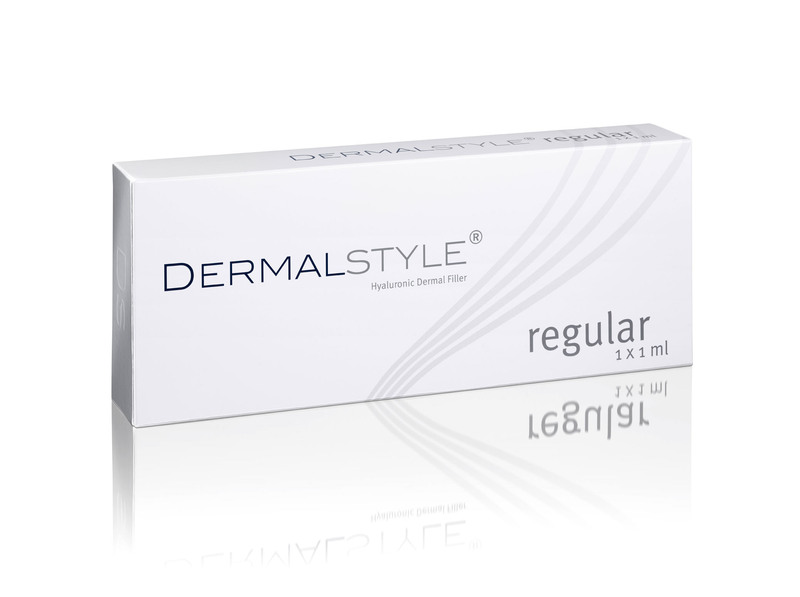 Dermalstyle® Regular contains non-animal sourced, crosslinked hyaluronic acid and has a concentration of 23 mg/ml. 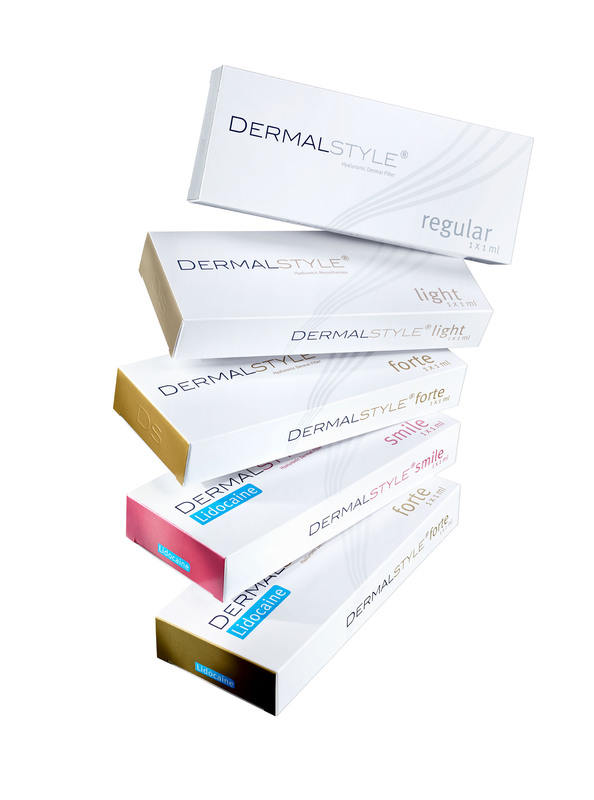 Dermalstyle® Regular is indicated for injections into the mid to deep dermis for the correction of moderate to severe facial wrinkles and folds (such as nasolabial folds). It is recommended for all areas of the face where the wrinkles are not too pronounced. 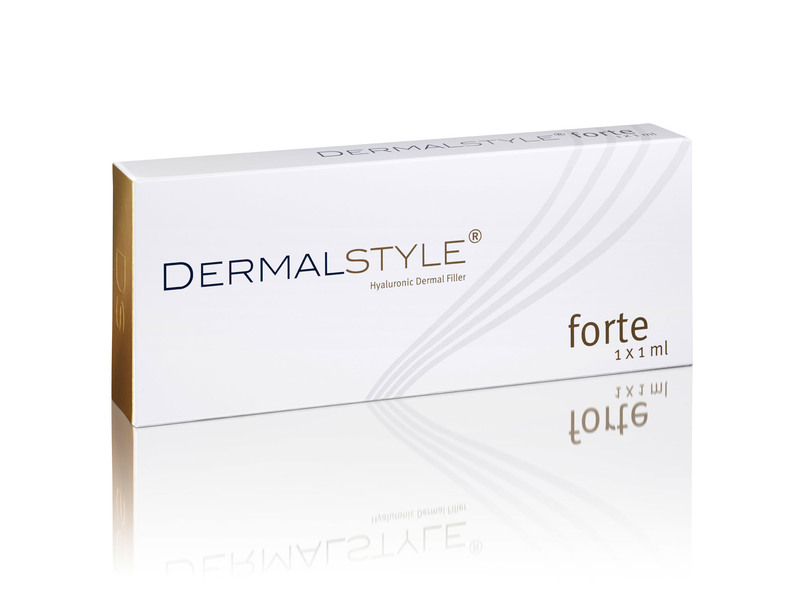 Dermalstyle® Forte consists of non-animal sourced, crosslinked hyaluronic acid and with a concentration of 23 mg/ml. Dermalstyle® Forte is an injectable biodegradable gel to increase or restore the volume of the face, remodel facial contours and correct deeper wrinkles and folds. It is indicated for injections into the deep dermis, subcutis or supraperiosteally. Dermalstyle® Forte consists of non-animal sourced, crosslinked hyaluronic acid, Lidocaine (0,3%) and with a concentration of 23 mg/ml. 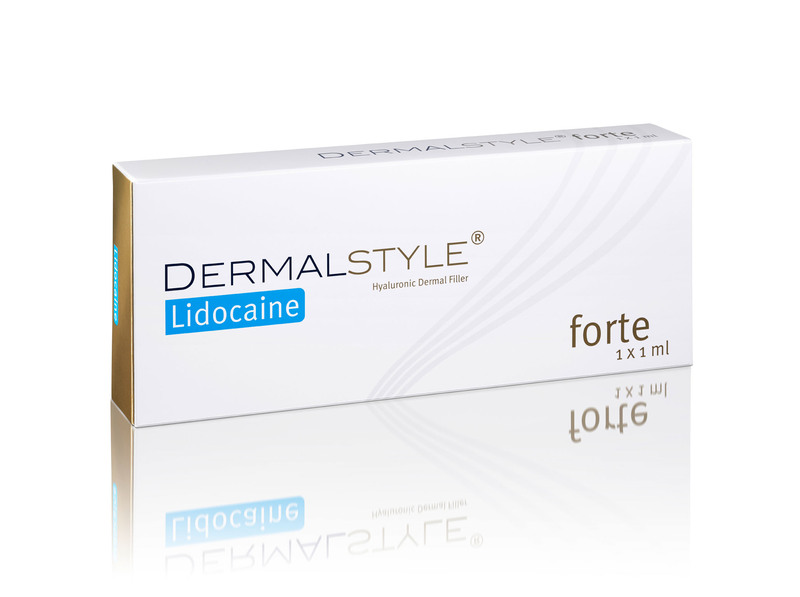 Dermalstyle® Smile Lidocaine contains a special non-animal sourced, crosslinked hyaluronic acid, Lidocaine (0,3%) and has a concentration of 23 mg/ml. 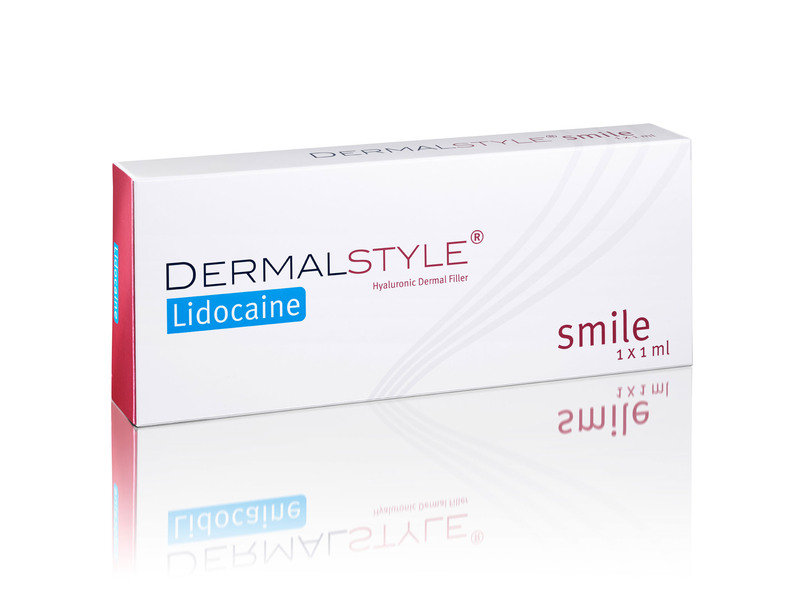 Dermalstyle® Smile Lidocaine is an exclusive, innovative gel formula to treat the sensitive area around the lips. It is a special injectable, biodegradable gel to increase or restore volume, to remodel contours and to correct the lips.